The young and inspiring fashion scholar Monica Sklar recently completed her first book. 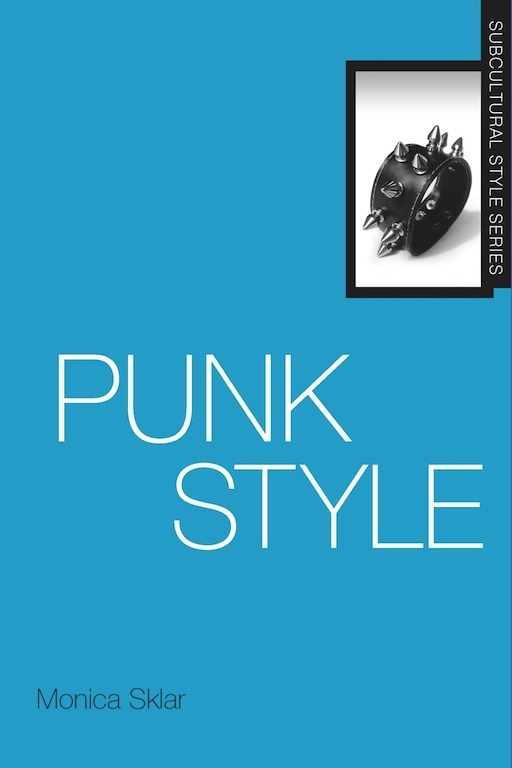 Titled Punk Style, it takes a wide look at the punk movement, following the 40-year subculture through its various manifestations beyond its 1970s origins. Fashion Projects discussed the book with Dr. Sklar. What inspired you to write on this topic? I started high school in the fall of 1991, a year often referred to as “the year punk broke.” Although punk predated this by over 15 years and had seen crossover success before it reached a new level in this era. The underground and mainstream were blurring in music, fashion, and ideas. This grabbed me and impacted how I would shape my adolescence and adulthood. My career paths always related to this intersection and as I went on to become an academic I wanted to explore it in depth, particularly the fashion and its meanings. The music and fashion of punk have always developed simultaneously and in conjunction as part of an overall lifestyle developed by communities of individuals who think along the same lines. However the body of literature mostly covers the music and its personalities with fashion as an afterthought, or sometimes, the fashion as trend and not “important.” Also much of the literature isn’t thorough or is out of date. I wanted to fill some of those voids. It turned out to be complicated to study because punk style has simultaneously maintained some of its relevance and original subcultural intent, it has also developed mainstream appeal and cache. This begs the question whether dressing punk means a person is punk, and/or, whether a person can be punk without dressing punk. Further muddying the waters is that punk is an esoteric and amorphous concept that is not easy to define and not all of those who self-identify as punk share the same perspectives. Through its 40 year history and various incarnations, as well as through personal experiences of the participants there are many ideas about what punk is and that made it fascinating to dive into. Another reason I wanted to study it was to give the research the energy and perspective I felt it deserved. As someone who self-identifies with the punk subculture, I felt my voice positively affected how the interviewees for this research addressed me and it was reflected in my ability to understand the language and symbolism as well as know the background to add context. I wanted to then pass this hopefully thorough approach to readers who are not familiar with the subject and also to have accesses to the scene in ways an outsider academic might not have. I worked hard to step back and holistically unite ideas to answer the research questions as a scholar of dress, design, and social theory. How your view of it changed from when you first approached it to the end of your research? Since it is something I feel personally connected to and have my own experiences with I wouldn’t say I had great changes of mind over the years of research, however I did learn things in more depth and explored some ideas that were new to me. It was interesting to learn about the differing perspectives of the UK (and some other global regions)and the US. The UK has the idea that commitment to punk means fully dressing the part and highlighting one’s efforts. The US has the idea that commitment means it is no ingrained it’s natural and should appear effortless and more subtle or coded. Also since the UK apparel was (mostly) initiated by artists and fashion designers it is more flamboyant than the US which was initiated by musicians and street kids. The most important thing I learned is about how punk style is embedded in the wearer’s perspective. The wearer dictates that something is punk, less so than the viewer defines them. This relates to another thing I really took away from the research about how individuals grow with the style and transform it with age. Since it’s a 40 year subculture I was able to research people at different points of life and I could see how it is not only a passion of youth. Punk style morphs with age and lifestyle changes and many people have developed ways to incorporate it into their maturation. However for some that means the visuals become less relevant as they enact the ideas they were trying to get across visually in other aspects of their lives such as jobs and manner in which they maintain a household and family. This validated that the style is symbolic of a larger lifestyle choice, and not a passing fancy. Some I researched felt the cliché notion that punk died whenever their version of it moved on (or they got older), however often those same people will explain how the lifestyle they now lead is related to the way they dressed in the past. Also something about punk is so flexible and accessible that new generations keep picking it up and making it their own and feel valid in their interpretation. Monica Sklar has a Ph.D. in Design-Apparel Studies from the University of Minnesota, focused on Socio-cultural and behavioral aspects of dress; 20th/21st century design history, theory, and criticism; aesthetics, innovation & creativity; retailing and consumers, with Supporting Areas of Study including: Social movements, subculture, popular music, deviance, and visual culture. 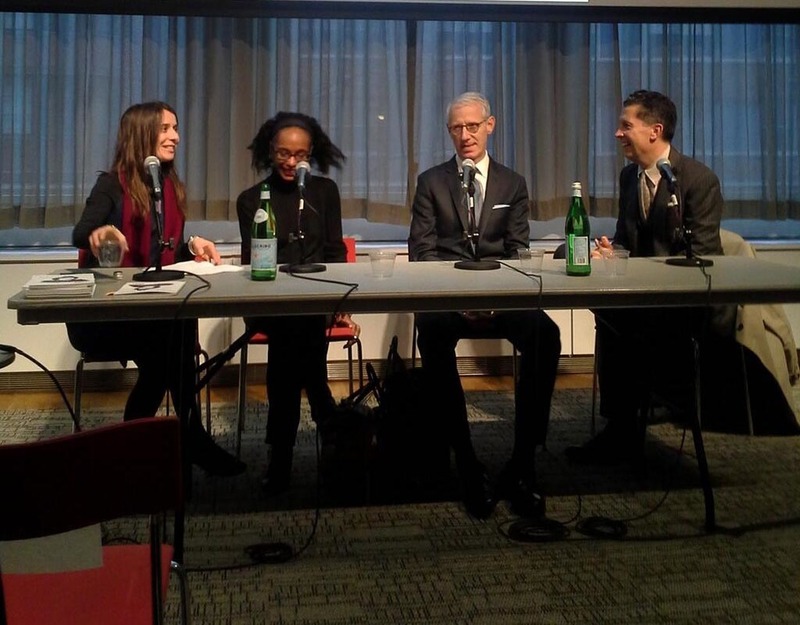 by Gisela Aguilar From left Francesca Granata, Robin Givhan, Guy Trebay and Stefano Tonchi. Photograph by Susana Aguirre. In celebration of the fourth issue of Fashion Projects, a panel discussing the current state of fashion criticism was held on March 12, 2013 at The New School. The panel, moderated by Francesca Granata, Assistant Professor of Fashion Studies at Parsons the New School for Design and editor of Fashion Projects featured three distinguished fashion critics, Robin Givhan (the first fashion critic to receive a Pulitzer Prize), Guy Trebay (culture and style reporter for the New York Times), and Stefano Tonchi (the editor-in-chief of W magazine), all of whom were also interviewed for the concurrent issue of Fashion Projects. The frank conversation took many directions by addressing a number of otherwise avoided topics within the fashion press, from the struggle for fashion writing to be considered a legitimate topic of discussion within established periodicals due to its prescribed association to the feminine realm, to the cultural valence of aesthetics in America versus Europe and how this difference manifests itself in each culture’s appreciation or understanding of fashion. Trebay reminisced on a pre-millennial era when the fashion scene belonged to a small, contained world and where the knowledge of this niche community was not widely dispersed as it is today. Stemming from observations he made in his Fashion Projects interview with Jay Ruttenberg, Trebay remarked that the cultural force of fashion catapulted quickly after 2000 through strategic moves by the few multinational corporations that monopolized the fashion industry. Fashion stars were churned out, runway shows become these theatrical spectacles, and with the aid of digital media, the fashion scene became a globalized attraction. Givhan added that the alliance between Hollywood and the fashion industry has intensified the public’s interest in all things concerning fashion, yet she lamented that this now symbiotic partnership has damaged the credibility of the industry. As such, much of the fashion content published is dominated by celebrity and consumer driven stories that bank off the entertainment value of fashion while doing little to enlighten readers about its intricacies and creative nature. The discussion brought to the fore a highly debated phenomenon amongst contemporary fashion journalists – the emergence of fashion bloggers. Indeed, the public access and participatory nature of digital media has opened the floodgates to an exorbitant amount of fashion interpretations, criticisms, and narratives, but it is precisely this lack of moderation that concerns the panelists. Between the three fashion critics there was an overall less than sanguine opinion of the fashion conversations found online. Givhan and Tonchi implied that the overt marketing objectives of certain popular fashion blogs compromised the ethics of journalism in that fashion houses and brands utilized these online personalities as PR tools, often times flying them out to Fashion Week or gifting them merchandise to promote on their personal blogs. In regards to the writing found in these digital spaces, Trebay and Tonchi not so subtly stated that the majority of the fashion conversations on blogs lacked a “compelling” factor and were subpar in that frequently the references to fashion history were inaccurate or the observations contributed no original perspectives to fashion discourse. Pointing to the main difference between print and digital media, Givhan observed that online there was no such thing as a correction – mistakes were rectified as “updates.” She went on to explain that because the barrier to entry is so low with digital media, Internet culture has cultivated a value to be placed on timely delivered and easily digestible content rather than well-researched information. The panel ended on a more personal note with a question from the audience asking the critics to reflect on peers whom they admired. Givhan praised the author and New Yorker writer Malcolm Gladwell as well as The Wall Street Journal’s fashion critic Teri Agins. Tonchi paid tribute to his fellow Italians, the late fashion writer and style icon Anna Piaggi and the author and Vogue Italia art and fashion critic Mariuccia Casadio. For Trebay, the work of author and fashion historian Anne Hollander was paramount in cultivating his perspectives on the intimate relationship between the body and clothing. Ultimately, the panelists’ critiques and observations advocated for fashion to be integrated and accepted as a part of a more informed cultural dialogue. Perhaps, the takeaway from this critical discussion could be best summarized by Tonchi’s obvious yet critical advice for the future generation of aspiring fashion writers in the audience – know your history! Gisela Aguilar is completing her MA in Fashion Studies at Parsons the New School for Design. Her thesis explores the evolving modes of consumption and production of fashion discourse specifically within print magazines and online fashion media. NB: Change of Room Update: Due to high demand, we changed the location to the Theresa Lang Student Center at 55 West 13th on the second floor. Again to RSVP, please visit eventbrite (more seats have been added!). Coming up this Tuesday March 12th from 6:00 to 7:30 pm in the Theresa Lang Student Center at 55 West 13th Street at Parsons the New School for Design is a panel on fashion criticism to celebrate the new issue of Fashion Projects on the same topic. The panel features Robin Givhan (the first fashion critic to receive a Pulitzer Prize), Stefano Tonchi (editor-in-chief of W magazine) and Guy Trebay (New York Times culture and style reporter) and will be moderated by me. If interested, please RSVP here as space is limited. 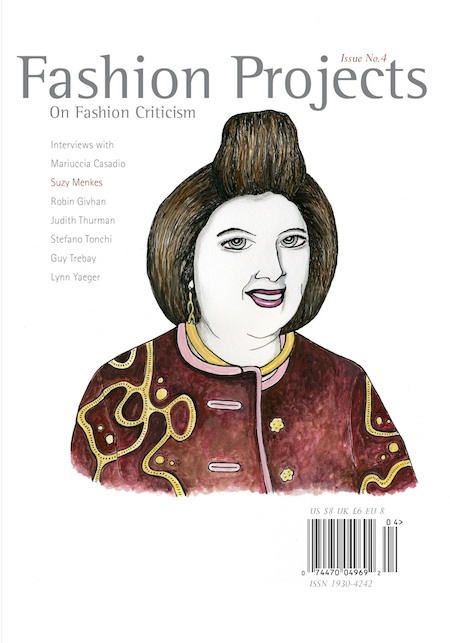 The issue, the journal’s fourth print edition, features interviews with Givhan, Tonchi, and Trebay as well as Judith Thurman (New Yorker), Suzy Menkes (International Herald Tribune), and other leading fashion critics. Praised by the Columbia Journalism Review for covering “the discipline, accessibly, from an academic perspective," it includes contributions from alumni of Parsons MA Fashion Studies and MA in the History of Decorative Arts and Design. It was designed by Sarah Smith, a graduate of Parsons BFA in Communication Design. The panel is made possible by the generosity of the School of Art and Design History and Theory and the MA Fashion Studies. The main question to be asked of fashion education today is “Are we training students to design clothes or to create fashion?” To be makers, creators, or both?” At Parsons The New School for Design we have re-approached our curriculum to address these questions, which has led to innovative, new pathways for our students to develop as designers. In order to understand the difference between the spheres of making and creating fashion, we have focused on design thinking as a method of envisioning a reality that does not yet exist, and as a means for achieving innovation. Fashion thinking involves harnessing the vast array of skills at the designer’s disposal, while embracing the chaos of the process itself. This might include upending traditional approaches or reapporpriating them to unearth new ways of creating and making clothes. “Fashion Thinking: Creative Approaches to the Design Process” highlights the work of nine students, documenting their responses to a variety of design briefs and their process: from idea to concept and design. These projects demonstrate that there are multiple entry points into that process and a million ways out. In between there are some consistent doors that each designer will go through (albeit in varying orders) and there are consistent tools they will utilize to accomplish the end result, but the rest is up for grabs. Emerging designers must learn to develop both their own personal philosophy of design and a particular way of working, which involves taking ownership of the process itself. Traditionally, fashion design texts have tended to suggest a “one-size-fits-all” approach to the design process: research – sketch – flat-pattern – drape – fabrication – make. While this order works for many designers, and are essential building blocks of the design process, this does not work for all. At Parsons we have developed a curriculum that encourages a variety of approaches to design versus heralding a formulaic method. If we persist in training fashion students to design via a process that is rote and mundane, we have missed the point entirely. In the BFA Fashion Design program here at Parsons, we have witnessed a distinct shift away from a right/wrong philosophy of teaching toward a more problem-based approach to learning. A student-centric model now exists where the fundamentals of design, construction, digital and drawing are taught in tandem with a full roster of studio electives and liberal arts that students select from a wide variety of options open to them across our university, The New School. Students learn traditional techniques and immediately apply them within the context of their own approach to design. In doing so they begin to articulate their own aesthetic and visual vocabulary from the outset of their experience in the program. Additionally, students are now encouraged to develop a central body of work that is re-contextualized across their suite of electives, which informs their work in new ways. There is no “right” way to approach design; there are no “wrong” turns. Everything matters. Designers are problem-solvers and problems present challenges that often lead to creative solutions that could not have been conceived of any other way. Within the unpredictability of the process ‘mistakes’ transform into new ideas, yielding fresh concepts that drive silhouette and form forward. Innovation happens on the heels of error in the midst of chaos and complexity. Jie Li, "Knitting and Pleating".